You got trouble in River City! 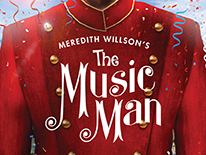 Professor Harold Hill and Marian the Librarian march into their first appearance at Goodspeed in a rousing new production of this great American musical. When huckster Harold promises to save an Iowa town by selling the dream of a boys’ band, Marian is the only skeptic. Until she starts to buy his pitch. Fall in love all over again with “76 Trombones,” “The Wells Fargo Wagon,” “Trouble” and “Till There Was You.” A glorious classic that will have you parading in the streets!